One of the main focal points linked to the establishment of a new curriculum was the aim to help every child reach his or her potential. Providing an enriched and stimulating environment is essential and every day we come across examples of teaching excellence. We see the efforts of many teachers to introduce a range of teaching styles and to really enthuse and motivate their class. Thanks to the support of the senior leadership team, teaching professionals can set out to develop children emotionally and help them to prepare for adult life as well as embracing an appreciation of lifelong learning. Hence the renewed focus on helping the children to experience personal, social, health and emotional development. Helping learners to gain an appreciation of lifelong learning. A lot of schools have chosen to adopt the Cornerstones curriculum. This topic based curriculum reflects the requirements of the National Curriculum in a structured and organised manner, helping pupils to remain engaged and to apply skills and knowledge. Often a whole school topic map will be planned, usually running on a biannual cycle. Learning about rocks and fossils is now part of the science curriculum for Lower Key Stage 2, whilst evolution and natural selection subjects are found within the science subject areas for Year 6, so Everything Dinosaur’s workshops have a very broad appeal. In addition, teachers of younger children find dinosaurs as an ideal term topic area, following on from children’s fascination for dinosaurs and providing an opportunity to develop and improve skills learnt to enable them to reach their full potential. Lots of literacy and numeracy activities displayed. The Cornerstones curriculum allows the teaching team to tailor the content and delivery of the teaching scheme of work to meet the needs of individual pupils. It is essentially, a cross curricular approach to learning, hence when we are delivering a dinosaur themed workshop to Lower Key Stage 1 for example, we like to be briefed on the learning outcomes that the teaching team require. In this way, we can cover key aims and help to reinforce learning, as well as providing plenty of numeracy, literacy and IT based extension exercises. During each of these interlocking stages, children have the opportunity to develop and improve skills learnt to enable them to reach their full potential. We are often amazed at just how much knowledge children demonstrate during our school visits, for example, during our last fossil themed workshop, children were eager to tell us all about some marine reptiles that they had been learning about. In the “Engage” element, pupils have the opportunity to kick-start a topic area with a memorable, thought provoking, first-hand learning experience. Everything Dinosaur’s dinosaur workshops in schools are often used as a provocation to help give the term topic a good start. Our dedicated teaching team will be undertaking a number of these provocations over the next two weeks as schools start a new dinosaur and fossil themed topic area at the beginning of the second half of the autumn term. In the “Develop” element, children improve their knowledge and understanding in relation to their topic. They develop and practice new skills learnt and have time to explore and create in relation to their term topic. Many of the extension ideas we provide to teaching teams allows children to build on their pre-knowledge and to apply this and newly acquired knowledge to a range of scientific themed exercises. All these extensions are aimed at helping to reinforce learning. When it comes to the “Innovate” section, we like to see pupils applying the skills and knowledge they have learnt in real life, palaeontological contexts. 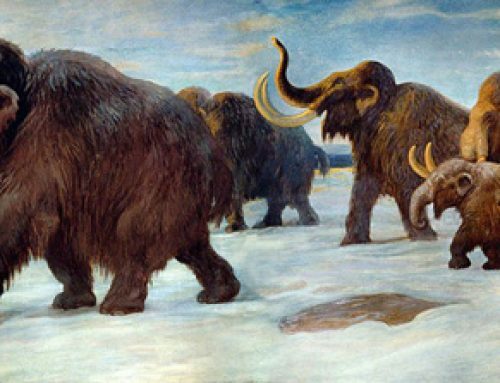 An example of this is challenging a Year 6 class to debate whether cloning a Woolly Mammoth would be a good idea. During our workshops, we like to give children the opportunity to explore real problems. This helps to inspire them through learning and allows them to see how classroom teaching can be applied to real scientific conundrums. Finally, we come to the “Express” section. This provides young learners with the opportunity to become performers, experts and to inform others. Demonstrating what they have learned can come in different forms, from a school assembly presentation related to mass extinction to writing and performing an expressive dance piece that depicts the extinction of the dinosaurs. We advise teachers to have a dinosaur and fossil themed “learning wall” for this type of term topic. This permits the class to showcase and celebrate their achievements as they have studied the topic. 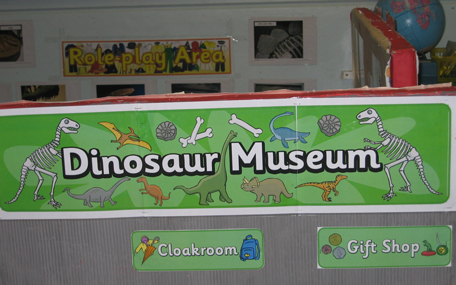 A dinosaur museum set up in the classroom can provide a useful focal point for showcasing the work undertaken. Come to the Dinosaur Museum! Come to our dinosaur museum! We wish everyone well with the start of the second half of the autumn term. Onwards and upwards with learning, whatever curriculum the school is following.